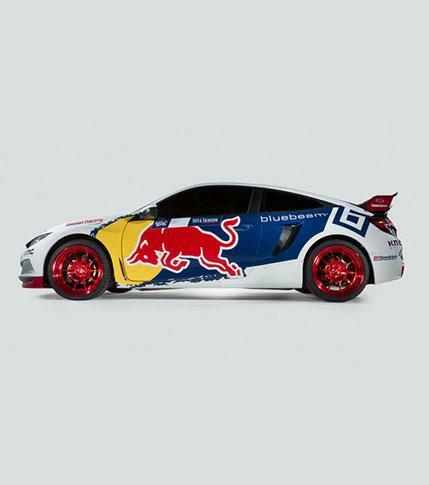 Today Honda unveiled the new racing livery for its Civic Red Bull Global Rallycross racecar, announcing plans to campaign the all-new turbocharged 2016 Civic Coupe in the 2016 series in partnership with Red Bull and championship-winning race team Olsbergs MSE. 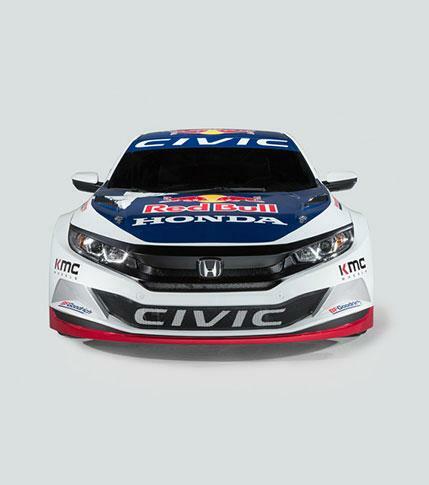 The Honda Civic Red Bull GRC team will begin racing on May 21 in Phoenix at the first event of the season. Developed from a production-model 2016 Civic Coupe chassis by renowned builders and racers Olsbergs MSE (OMSE) with technical assistance from Honda Performance Development (HPD), the all-new Civic Red Bull GRC car is built to withstand the rigorous demands of racing in a series that emphasizes repeated aggressive acceleration and varied terrain. The car will boast more than 600 horsepower, turn in a 0-60 mph time of 1.9 seconds and is designed to handle the 70 foot table-top jumps featured on each racetrack.